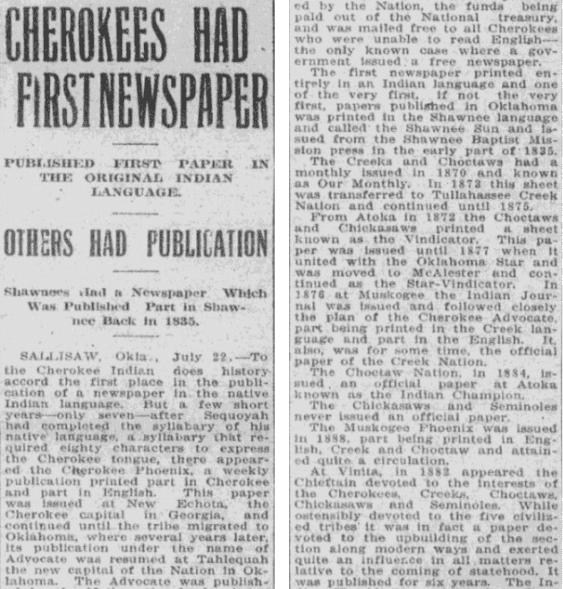 Introduction: In this article, Mary Harrell-Sesniak writes about the “Cherokee Phoenix” – the first Native American newspaper published in the U.S. – and shows how old newspapers can help you research your Native American roots. Mary is a genealogist, author and editor with a strong technology background. Researching Native American ancestry in newspapers is challenging – and even more so when the records we seek were not published widely. But if you put your sleuthing mind to searching GenealogyBank, you’ll find many articles about Native American descendants. Of special interest in GenealogyBank’s collection are some specifically Native American newspapers. For example, if you’re researching Cherokee roots, be sure to check out the Cherokee Phoenix. This newspaper is of preeminent importance because it was the first Native American newspaper published in the United States. 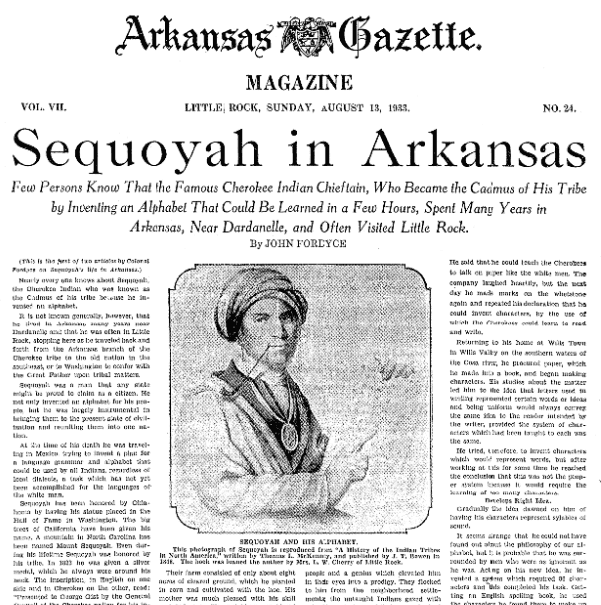 The first issue came out 21 February 1828, printed in New Echota (New Town), capital of the Cherokee Nation (present-day Georgia). The newspaper lasted until 1834, and was bilingual: articles were in English and Cherokee, based on the Cherokee syllabary developed by Sequoyah. In order to create written communications, Sequoyah (aka George Gist) developed a unique writing method sometime between 1809 and 1820 so that members of the Cherokee Nation could read their language. 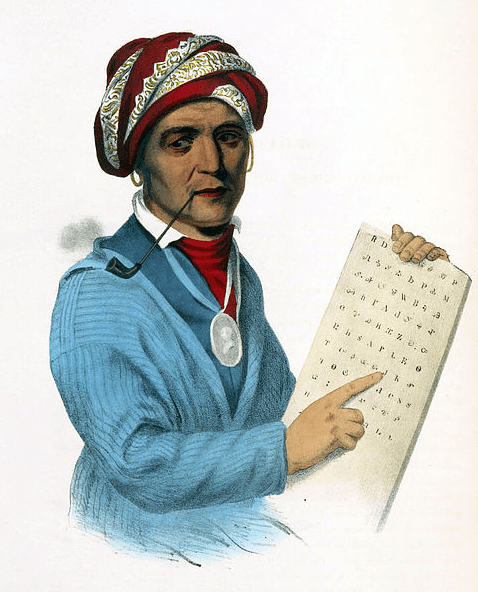 Illustration: Sequoyah with a tablet depicting his writing system for the Cherokee language; 19th-century print of a painting. Lithographers: George Lehman (d. 1870); Peter S. Duval. Painter: Henry Inman (1801-1846); copy after a painting by Charles Bird King (1785-1862) which was lost in a fire in the Smithsonian in 1865. Credit: Wikimedia Commons. Sequoyah’s syllabary is sometimes called the Cherokee Alphabet, but this is technically incorrect. An article at native-languages.org explains that each symbol represents a syllable and not just one letter. Its usage was widely accepted by 1820, therefore achieving a high rate of literacy among Cherokee tribal members. You’ll find references to the Cherokee Phoenix in many other newspapers. 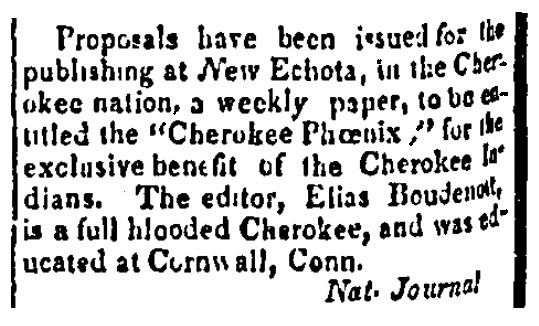 Before the first issue was even printed, this 1827 Connecticut newspaper announced that the editor would be Elias Boudenot, a formally educated Cherokee. Other newspaper articles about the Cherokee Phoenix allow us to learn more about the history of the Cherokee Nation, the laws of the time, and how this newspaper came about. If you have established your Cherokee roots, be sure to browse the Cherokee Phoenix and another important Native American newspaper that you’ll find in GenealogyBank’s archives: the Cherokee Advocate, published in Tahlequah, Oklahoma, between 1844 and 1906. Note: This is not the same as another newspaper of the same name published earlier in Marietta, Georgia. Do You Have Cherokee Roots? If you think you are related to Sequoyah, either through his Cherokee mother, Wut-teh, or through his father’s ancestry (probably Nathaniel Gist, a member of Washington’s Continental Army), we would love to hear from you. Although I was unable to research Sequoyah’s full roots in the newspapers, there are a number of references in GenealogyBank’s archives which may be of interest genealogically and historically, such as this article. Don’t forget to network with the Cherokee Nation. Although their website notes that they don’t do genealogical research, they do have information about application for Citizenship and suggestions for research. Note: November is Native American Heritage Month. An online collection of newspapers, such as GenealogyBank’s Historical Newspaper Archives, is a great way to learn about Native American history in general, or explore your Native American ancestry by researching individuals from your family tree. I’m looking forward to researching my Family. Glad you are excited about researching your family. Genealogy can be quite rewarding.